Daniel is maybe a more typical middle school kid than most kids would like to admit. He's smart, gifted even. He is writing a book. His best friend, Max, is a talented athlete. Daniel is not a talented athlete, but plays backup kicker on the football team. Mostly that means he fills in when the water boy is gone. He plays because his father, brother Steve, and best friend, Max, all love football. And Daniel has a crush on a cute and popular girl named Raya. Daniel is not like all the other kids in some ways. He suffers from something he calls the Zaps. The Zaps make him do crazy things, such as like some numbers and not like others, flick light switches, and sometimes have weird attacks at school. He also has a routine he does every single night, that involves taking so many steps to the bathroom, brushing his teeth a certain number of strokes, wiping the rim of the toilet, drying his hands on a specific towel. He can't sleep until he has done the routine perfectly. Sometimes that takes several hours. 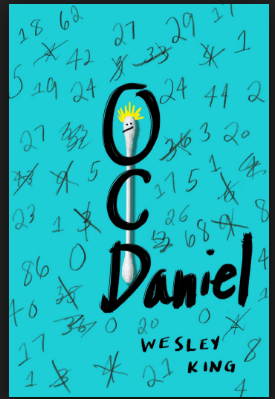 Daniel's life takes an unexpected twist when a girl named Sara, who the kids at school call "Psycho" befriends him. Sara has a special aide who accompanies her to all of her classes. Even so, sometimes she melts down in class and has to be removed. Sara needs Daniel's help in finding out who killed her dad the year before. It is Sarah, who tells Daniel that his Zaps have an actual name. Author's notes reveal that this book is partly autobiographical. There is information about Obssessive Compulsive disorder and resources to get more information. A book lots of middle schoolers and high schoolers will love. And a book that some kids will need. Frederick Lipton, the actor, and Mr. Pip, the monkey are best friends. When Frederick’s birthday rolls around, Mr. Pip can’t wait to give Frederick a special, handmade card. Because Frederick is so famous, he receives a number of other gifts- including a solid gold car from the sultan of Brunei and an invitation to dinner at the White House and Mr. Pip can’t find a time to give Frederick his simple present. Mr. Pip becomes very sad and Frederick is concerned. He takes Mr. Pip to every vet in town; they all say he is fine, but Frederick is not convinced. He finally leaves him at the Guild of Geniuses, where four of the smartest people in the world hold court. 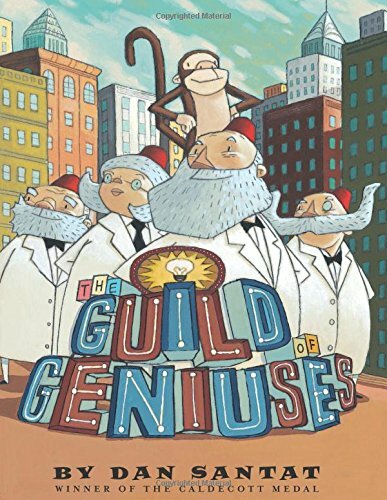 The geniuses try everything they know, including bringing in other monkeys especially from Africa, as well as sending Mr. Pip into space, but nothing works. Will Mr. Pip’s problem ever be solved? A terrific primary grade book about friendship. And wisdom. And things that matter. A child saw the cat. A dog saw the cat. 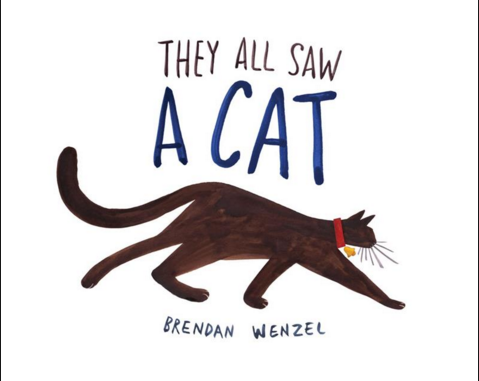 But they all saw the cat very differently. A gorgeous new picture book that would be absolutely terrific for introducing a unit on point of view or perspective! And the illustrations are interesting enough that I think the book could get a look from the Caldecott Committee! An added bonus: Emily Arrow has written a song to go with THEY ALL SAW A CAT!